PocketBook Mini will become the perfect companion for those constantly on the move. Those who like reading in transport, in a cafe at lunchtime, during a midday break in the park or while traveling will appreciate its compact size and handy form factor (5 inches). PocketBook Mini fits any pocket, and its practical layout of function keys and a five-way joystick let you use the device with one hand. With its light weight (only 130 grams) and compact size (thickness - 7.2 mm.) PocketBook Mini won’t take much space in even the most petite handbag. 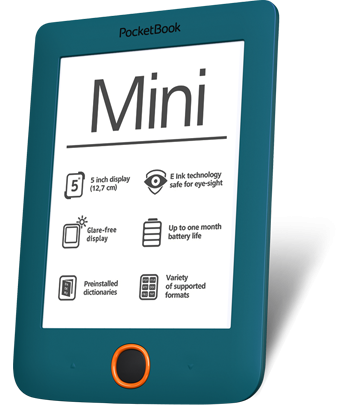 A range of brand covers specially designed for PocketBook Mini will protect the tiny pocketable reader from unwanted external influence. These covers are installed quickly and easily, due to a special fixture. Covers do not affect the thickness and dimensions of the device, but are reliable protection for PocketBook Mini screen. Special covers are a benefit for the device and make it look even more stylish and attractive. PocketBook Mini connects to Internet via in-built Wi-Fi module. Look for a new PocketBook pocket reader at attractive price in PocketBook online store, as well as in the shops of our partners. Enjoy fascinating reading «in motion»! PocketBook Basic 2 battery life is about one month of active reading! 4 Gb of internal memory expandable to 32 GB is enough to keep a full library which is always at your fingertips! 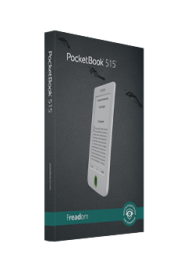 PocketBook Basic 2 let you realize that e-reading is easy and fascinating process.